30 color clipart images and 27 black and white images. All are fall themed (Halloween/October and November). 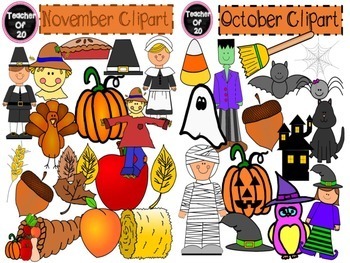 These are my October Clipart Pack and November Clipart Pack. You save $2.00 by buying this bundle. B&W images: apple, acorn, bat, broom, candy corn, cat, cornucopia, Frankenstein, ghost, hat, haystack, haunted house, jack-o-lantern, leaf, leaves, mummy, owl, peach, pilgrim hat, pilgrim boy, pilgrim girl, pumpkin, pie, scarecrow, scarecrow head, spider, turkey, wheat, witch.